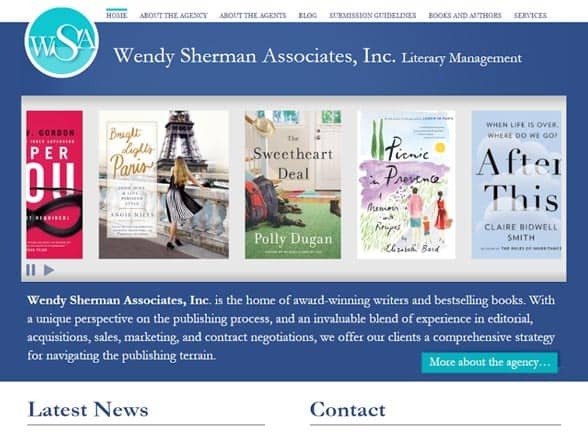 Wendy Sherman Associates, Inc. is the home of award-winning writers and bestselling books. With a unique perspective on the publishing process, and an invaluable blend of experience in editorial, acquisitions, sales, marketing, and contract negotiations, they offer their clients a comprehensive strategy for navigating the publishing terrain. As a full service agency, they also partner with major film and television agents in Los Angeles. With a long-standing tradition of attracting and identifying quality material and a strong knowledge of market trends, they have proven success discovering first time authors as well as managing the work of those with established careers. They pride themselves on cultivating long-term relationships with clients as well as with publishers throughout the world.